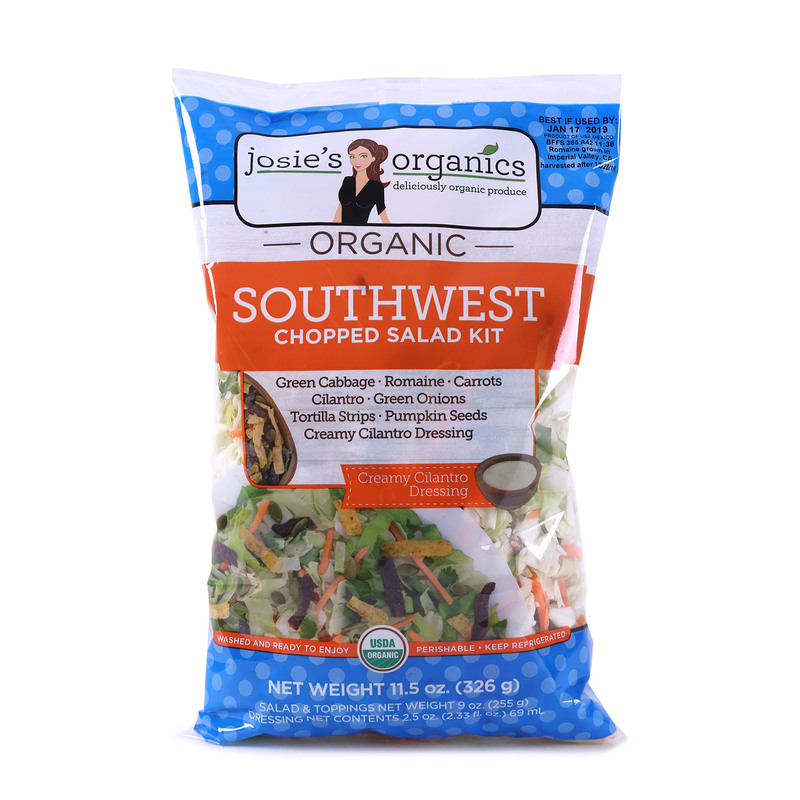 This Southwest Chopped Salad is a tasty blend of green cabbage, romaine lettuce, carrots, cilantro and green onions. Crunchy pumpkin seeds, colorful tortilla strips and creamy cilantro dressing bring the ultimate flavor to this fun, fiesta salad! Use this mouthwatering mix to top tacos or toss with grilled chicken and avocado. Add zucchini or squash and sauté with olive oil for a quick and healthy side dish. 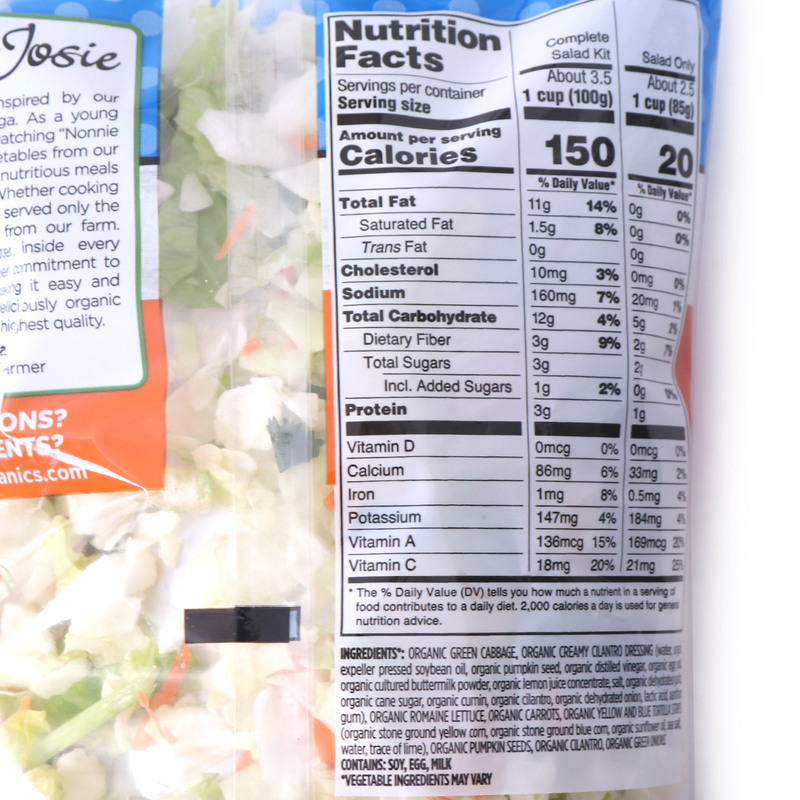 You’ll enjoy every bite of this salad and love making easy meals in minutes! Organic green cabbage, organic creamy cilantro dressing (water, organic expeller pressed soybean oil, organic pumpkin seed, organic distilled vinegar, organic yolk, organic cultured buttermilk powder, organic lemon juice concentrate, salt, organic dehydrated garlic, organic cane sugar, organic cumin, organic cilantro, organic dehydrated onion, lactic acid, xanthan gum), organic romaine lettuce, organic carrots, organic yellow and blue tortilla strips (organic stone ground yellow corn, organic stone ground blue corn, organic sunflower oil, sea salt, water, trace of lime), organic pumpkin seeds, organic cilantro, organic green onions.